Assuming that you've got all the basic techniques of trials riding covered, couldn't you just take your mod or stock bike and ride over urban furniture, in the streets of your home town, and call it "street trials"? Well, not exactly. Of course, a 20" mod or a 26" bike optimised for competition will take any challenge, from muddy river beds to stacks of pallets or concrete benches, but its radical geometry together with a very low gear ratio will largely constrain your riding style to pedal-kick assisted action. Add the On/Off binary-modularity of rim brakes on tar-spread ground rims and forget about flowing moves altogether. Now, if you're looking to adopt a more laid-back riding style, on something that looks more like a normal bike, but with a versatile geometry and a gear ratio specifically designed to accommodate both trials riding and BMX-inspired jumps and tricks on fast flowing lines, then a 24" street-trials bike is what you need. Here, street trials bikes offer an interesting middle point between the high maneuverability of compact BMX geometries (a steep head tube angle for a tight wheel base and easier spins among other things) and the trials-proven behaviour of short chainstays with a lower gear ratio than BMXs, all this fitted with over-engineered 24" wheels for their rolling capability but also for added strength compared to 26" hollowed-out rims. All of today's street trials bikes feature a seat, something long gone from the competition landscape, but which gives the bike a "normal look" despite its extra wide tyres (typically around 2.4"). Interestingly, for riding this "normal looking bike" in the most unusual way (blending trials with fun BMX moves), passers-by will instantly give you much more credit than if you were standing on a bizarre seat-less competition bike (because arguably, the weird bike does it all, they can't relate to it). 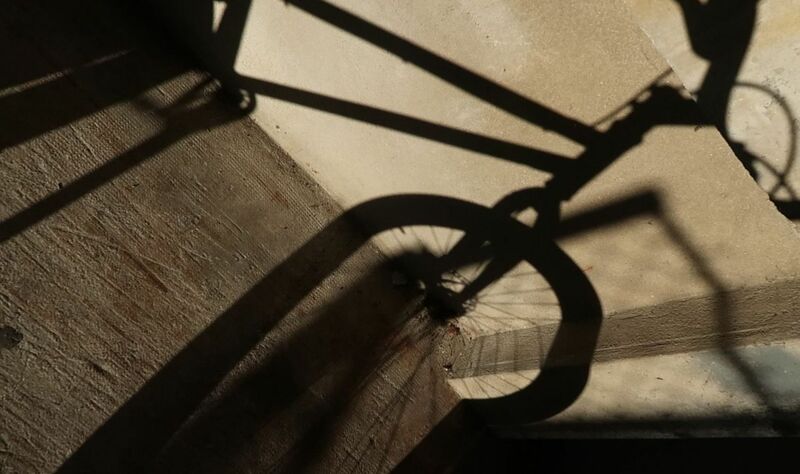 You'll find that although they are heavier, disc brakes offer more braking modularity than rim brakes, from the slight touch to gently control a nose wheelie down a slope, to the full stopping power necessary to land your back wheel sharp onto a rail. Top of the range street bikes are either built from high quality Cr-moly steel with double-butted tubing or thick aluminium tubing. Steel combines strength and springiness (that's very subtle) for a responsive ride. Often featuring BMX-type steel cranks and double-walled rims, these solidly built bikes are several kilos heavier than your typical competition bike (around 12kg or so, versus 8 or 9kg), but they'll take a hell lot more abuse too before falling apart. 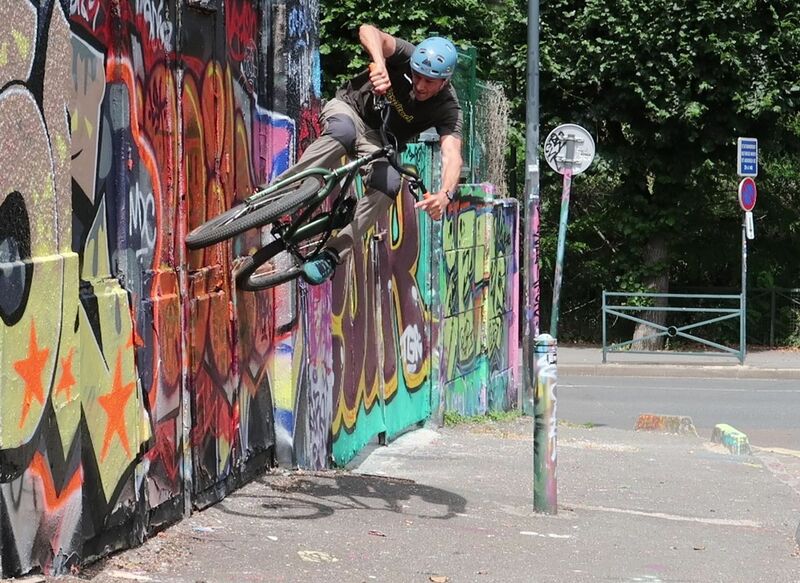 Wall ride onto wobbly doors. In fact, if you have been riding on lightweight natural competition bikes before, your first impression could be that of riding an armoured tank, not just because of the weight, but also partly because of the harder gear ratio. And to make up for it, you will want to use a lot more momentum into your riding, leveraging every curve, ramp or bump to lift the bike up. With time, you'll definitely focus more on fun flowing moves, exploring new lines of creativity rather than seeking pure performance as you would have got used to on a trials competition bike. 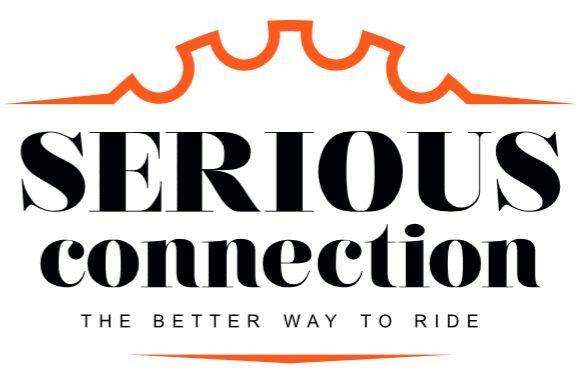 You'll often get more attention from the general public, passers-by will connect more easily with you than if you were riding a BMX too, maybe because street trials doesn't have a bad boy reputation nor is it tagged as a rebel youth sport, but instead, tags along the more general mountain biking scene. Danny MacAskill's positive fame and attitude definitely helps street trials convey a good image. 360° bunny hop over a chain. 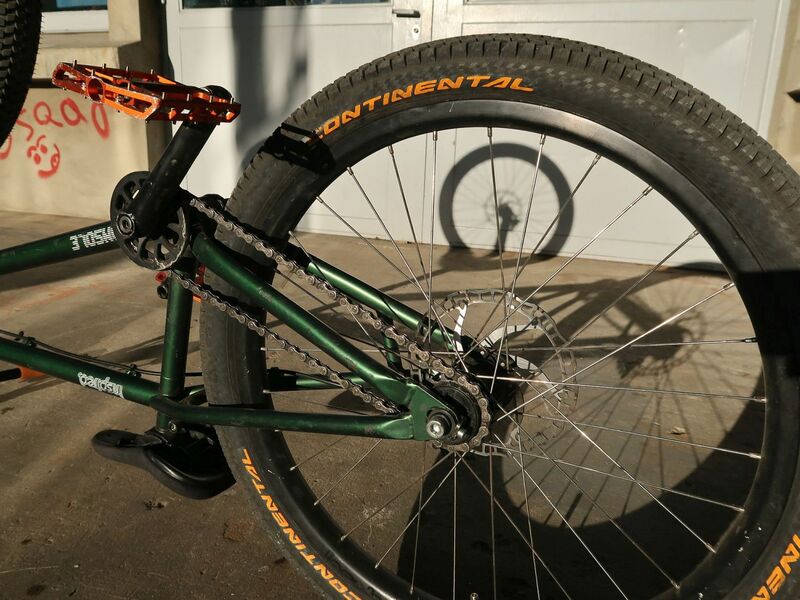 Geometry is always a matter of choice, and trials riders have long proven that you could ride trials on any type of bike (from fat bikes to fixies or even carbon road bikes) providing that you ran the proper gear ratio. But having the right geometry for the type of riding that attracts you the most still makes sense, and riding a street trials bike is definitely a lot of fun, combining a casual look with a strong potential for serious action. The chain stays on 24" street bikes range from 360mm to 370mm (compare this to 375-390mm typical for 26" stock bikes) for an overall wheelbase varying from 980mm for the shortest models to 1000mm. That makes very short and responsive bikes, if you consider that even 20" trials bikes usually have a longer wheelbase, up to 1040mm (extended up to 1115mm for 26" bikes). The steep head angle, around 74° (versus 70° typically in natural) contributes to the compactness of the bike while maintaining a long reach for a comfortable ride. 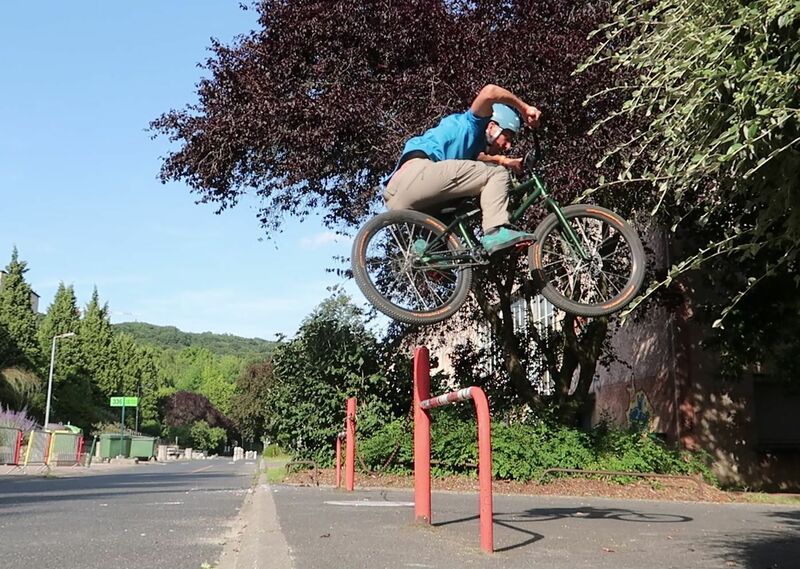 It also makes it easier to barspin, or conversely, to spin the frame around the bars in fancy moves such as foot-jam tailwhips (because the head tube is more vertical). An extra feature that comes handy on most street bikes is the hollow stem cap that lets you run your front brake cable through the fork steering tube, so you can keep it short and tidy through multiple bar spins. Bunny hop with a bump boost from the kerb. 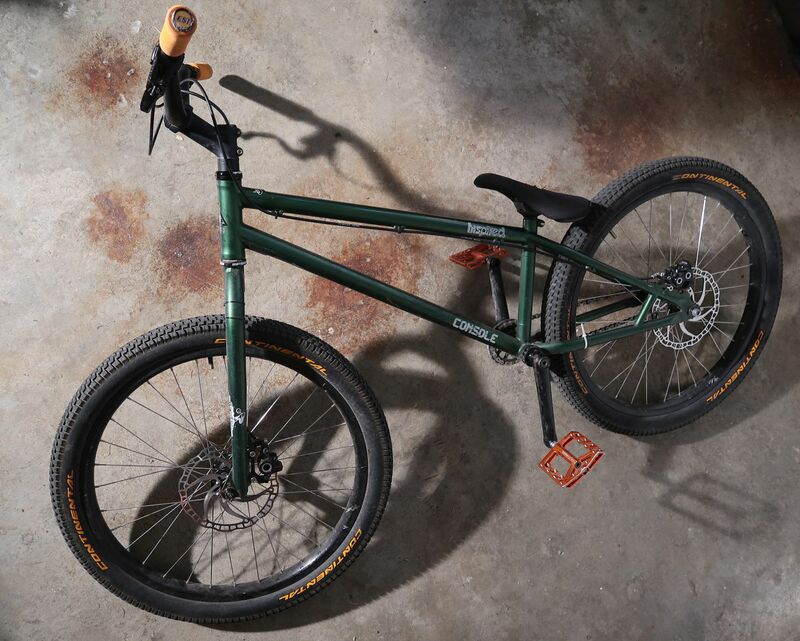 The most perceptible geometry change when moving from a natural trials bike to a street trials bike is the bottom bracket height, much lower on street bikes. It varies from +10mm to +25mm depending on the model you choose, placing your centre of gravity a few centimetres lower than on competitions bikes (from +50 to +85mm on mod bikes, +20 to +80mm on stock bikes). This low bottom bracket, together with the compact wheelbase and high-rise handlebars make any street bike a bunny hop pulling machine. Whilst on 26" competition bikes, most take-off techniques rely on a precise pedalling sequence just to pull the front wheel up - on a street bike, you'll clear most obstacles without messing with the pedals, just pulling a plain bunny hop at any speed you please. No need to figure out your pedalling distance from the obstacle, just go fast enough and relax before you pull your best bunny hop. Once you've figured out that speed and geometry are on your side, riding street trials is a truly liberating experience. The faster pace of street bikes is also due to their higher gear ratio. Typically, street riders will opt for 22 teeth chainring with a 16- or even 15-teeth freewheel mounted on the rear wheel. A 22/15 gear ratio means 1.4666... wheel turns for each crank turn. Some riders even opt for a 25 teeth chainring but it nearly becomes impractical to pedal kick efficiently. Compare this with your typical 18/16 gear ratio on a 26" wheel bike (1.125) and do the maths with the wheels' respective circumferences. The higher gear ratio of street bikes does not merely compensates for their smaller wheel size, it actually makes them about 20% faster when you measure the actual distances covered by one crank turn. That's useful for all sorts of fat jumps and wall rides involving small kicker ramps. But this comes at the expense of pedal kick agility. Since the developed torque is higher, it makes the bike feel heavier and less responsive to traditional pedal kicks. 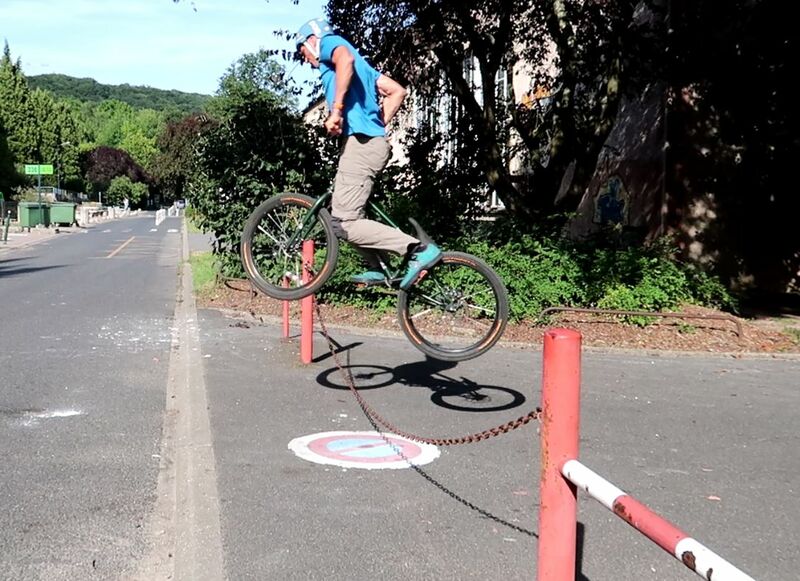 On the other hand, it makes it easier to back pedal when cruising backwards, say after landing a 180° bunny hop or while performing a fakie wheelie. The handlebars' up sweep in line with the fork. Now, the most debatable adjustment on any given bike is probably the position of its handlebars. Whilst on traditional trials bikes, the trend is to lower the bars forward for a plunging position on top of a long and low rise stem, street bikes are better off with their handlebars positioned straight up on top of a short riser stem. That is, with the up sweep of the bars pretty much in line with the head angle of the bike (or the fork's legs). This will make the front wheel and bunny hops easier to pull than if you set the bars leaning forward. Generally speaking, rotations will also be easier to perform with the handlebars setup in this upright position. If you've been riding trials on a natural competition bike before, you may feel a bit cramped at first on a brand new street bike, but after a few weeks of adaptation, you'll realize how versatile this setup can be. Reversely, being accustomed to a street trials bike, any competition trials bike may feel completely unrideable and unnatural to you. All bike types share the same basic techniques but the riding postures are so different that they require a complete re-thinking of your balance. Riding street, you'll want much harder tyres than when riding natural. First because you don't want to pinch flat too easily when hitting square concrete edges at speed, but also for a more responsive and faster ride (less rolling friction). High pressure also makes it easier to spin around (over the rear or the front wheel) and will prevent the stick and twist effect that under-inflated tyres could yield. 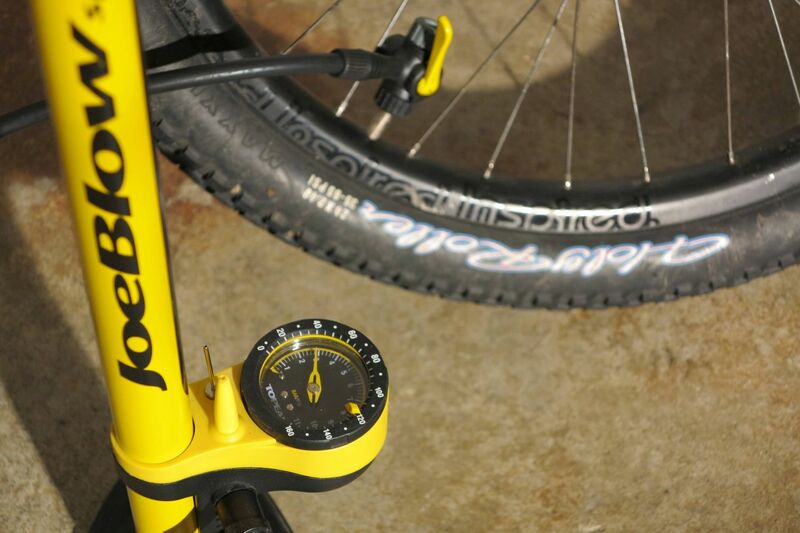 Typically, this translates into 3 bars/40psi or more for both wheels. The more pressure, the faster and sturdier the feel with more control on rolling lines (no drag, no squash), but put too much pressure and you could miss out on the bump-boost effect that most jumps and bunny hops rely on, when hitting a small step or a kicker ramp. 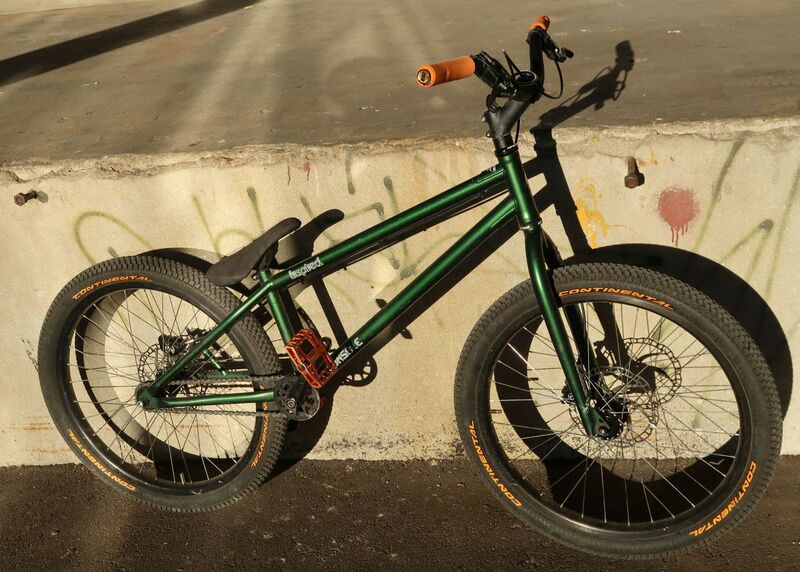 Most street trials riders like to have their chain pretty tight (maybe a bit tighter than on a natural trials bike). 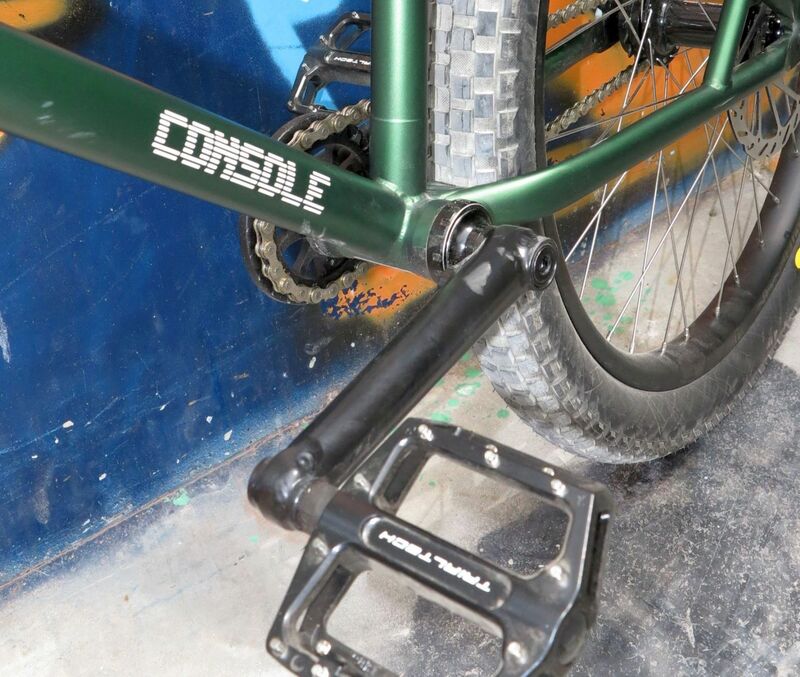 This prevents the cranks from spinning loosely when you let the pedals go during a tailwhip, ensuring you can catch the pedals at the same position you left them. 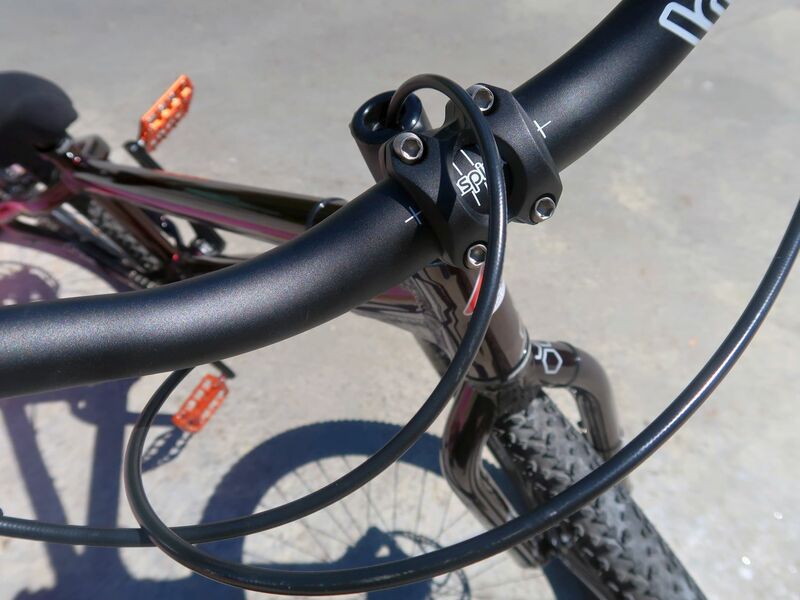 Some riders like to insert a rubbery band (some old inner tube) between the bottom bracket and the left crank arm so the friction stops any unwanted back-spin.